Forum Index > Historical Arms Talk > General pattern for a 14th century aketon? Posted: Sun 11 Mar, 2007 10:00 am Post subject: General pattern for a 14th century aketon? Does anyone know how a mid-late 14th century aketon (to be worn beneath a maille haubergeon) might look like? I'm thinking of the general pattern - would it be simply cut from straight pieces or would it more likely have been taylored after the fashion of the time (with a slim, turned in waist etc)? Would it have been pulled over the head like a kyrtle or would it have had a front lacing or buttoning like the fashionable doublets or cote-hardies of the time? Which thickness would be appropriate, considering that the garment is to be worn with a haubergeon over it? There seems to be a gap of knowledge about padded armour between the 13th century (like the armour shown in the Maciejowski-bible) and the mid 15th century (like the jacks worn in the wars of the Roses, the burgundian wars etc). I would be glad if someone could help me out. Thanks for the link Chad, but I can't find any of the images there showing an aketon worn beneath the maille. We don't know a lot about 14th-century arming garments. Part of the problem, of course, comes from the fact that armor changed so drasticly during the 14th century. Are you looking for a true Aketon (in the sense of a sleeved, knee-length padded garment worn under a great hauberk) or are you asking for a more fitted doublet such as would be appropriate under the more fitted armors of the later parts of the century? Since you mention being shaped to go under armor amd the early-14th-century Aketon differed but little, if any, from those worn from the end of the 12th century I will start by assuming the latter. Many of us who do 14th-century impressions have been using the Charles de Blois pourpoint as our model for arming doublets. This isn't strictly accurate since the CdB poupoint is clearly and obviously a civilian garment not meant to be worn under armor (and to those who doubt that, simply look at the size of the sleeve buttons--they would never fit under the lower canons of the vambraces), however it fulfills a similar niche, i.e., holding up chausses is similar to holding up cuisses. The Grand Aissette sleeves of the CdB pourpoint are ideal for supporting cuisses because they hold the body of the garment in one place when you lift your arms, and essential quality if you're to point your cuisses to your doublet. Many people err in making these pourpoints by putting too much fabric under the armpit. The armpit must be tight so that the vambraces (which are pointed to the sleeves of the doublet) don't tend to slide up or down as you move. I will attach some pictures here. The first is the only primary source illustration to show an arming doublet--the others are from the CdB pourpoint, however I'm told the pattern diagram is slightly flawed. I hope this helps. If you have any questions I'll try to answer them. A conjectural layout; I'm told it is flawed in terms of the shapes of some pieces, but it gives an idea. I Guess I'm looking for a more simple, earlier type of aketon - that is if they were still around in the second half of the 14th century...? My intention is not to wear full armour, but just a maille haubergeon like the one in this picture. Perhaps the jupon of Charles VI would be a good pattern? The Charles VI garment goes *over* armor, not under it (although you might wear a simple Churburg-14 style breastplate over it--we see that in the effigy of Walter von Hohenklingen). Besides, if you look at a good photo of the Charles VI lentner you'll see that it has that same pigeon-chested look and was *obviously* mean to be worn over a breastplate. The harness you showed in the picture doesn't really make a lot of sense to me. The leg and arm armor is indicative of the late 14th century and I find it a little hard to believe a man at arms from that period wouldn't have a breastplate. In any case, I'm very sure anyone from that late would absolutely be wearing a fitted arming doublet. The tube-like ones went with great hauberks, not with a haubergeon such as the one in the picture. Remember that the military styles of the period you're talking about mirrored the civilian styles, and the pigeon-chested, wasp-waisted look was all the rage. And seriously, consider wearing at least a Churburg-14-style breastplate over the harness. It weighs little, isn't restrictive, is very comfortable, and it really fleshes that harness out. I'm not saying a man at arms would never go without his breastplate--far from it--just that it makes the harness more complete. While it's true that the jupon of Charles VI is intended to be worn over armour, would the basic shape/pattern of the garment be appropriate for an aketon to be worn under the maille? At least it's much easier to make than the pourpoint of Charles de Blois. My intention is to portray a well-to-do yeoman archer, not a man-at-arms. But I guess that the basic padded armour was the same regardless of class? I'm not aware of the leg harness being pointed to the aketon/gamebson. I've always understood them to be attached to a belt as in the 'King's Mirror' or an arming doublet as in 'How a Man Shall be Armed'. Especially as the problems you mentioned are easily solved by either of these methods. The short answer to your question is that I don't know and I've looked hard. I bought a pattern online that came highly recommended and was sorely disappointed :P If you have some experience in making sewing patterns then you might try simply examining modern repros like from Revival or Matuls and ad-libbing it. It's not like there was one true pattern after all. I recommend Medieval Tailor's Assistant by Sarah Thurston for getting started on period garb and it has some info on how to make your own patterns, too. A living history site like Living History Library or FireStryker might help as well. An arming doublet is exactly what I was talking about--not an aketon. An aketon is the tube-like garment worn under a great hauberk. That's why I was careful to talk about arming doublets, not aketons and to tell Michael he needed an arming doublet with those plate cuisses, not an aketon. 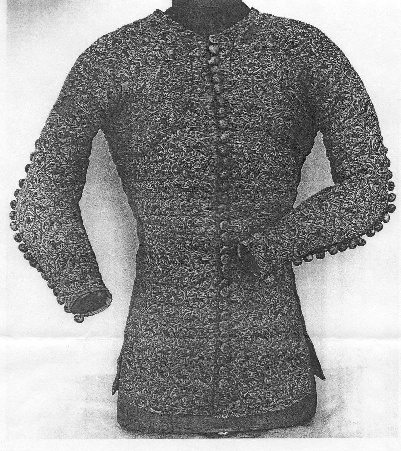 The arming doublet is exactly what How A Man Shall Be Armed was talking about, however the evidence suggests that 15th-century arming doublets were different from 14th-century ones, as shown in the picture I posted from Lancelot. And the picture you linked to from Historic Enterprises is highly conjectural. There is evidence a garment like that was worn to hold up hose but none that they were used to hold up cuisses. The body shape is what I use for my arming pourpoint under my armor but I use an arm shape much like the CdB on the lower arm and put a set in sleeve on the upper arm that way I get a tight sleeve with the elbow hinge. For other arming doublet/pourpoint type patterns Revival makes a version. Scroll to the bottom of the item description and you'll see drawings of the original artwork that are (part of) the basis for the design. With these pictures and the Charles du Blois garment we have five distinct possible patterns for such a garment. I got the Charles du Blois and Charles the VI garment mixed-up :-P I reread your post and realized I'd gotten confused. My mistake. On another note: What is a 'great hauberk'? I was not able to find the term anywhere. I'm also unsure on your use of 'tube-like' to describe the shape of an aketon. Any garment that extends past the hips has to flare or be slit to allow full movement of the legs. Are you describing a construction like a surcoat? I think Hugh is refering to a rectangle construction garment which most reenacters call an akenton, a padded tunic without gores basicly. No worries, that's easy to do. Some people use that term to refer to the full-sized hauberk of mail worn at the end of the Age of Mail--longer than knee length, full-length sleeves with attached mufflers, etc. I use it because some people don't understand the difference between a hauberk and a haubergeon and that seems to make it clearer for them. I'm just talking about a less-fitted garment of the sort worn under the hauberk; I say "tube-like" to distinguish it from the very fitted and shaped arming doublets such as those shown in the Lancelot picture I posted. And yes, they were slit. These are not accurate. How could you point your vambraces to a vest? The vest they copied was used to hold up chausses--wool leggings, like modern pants--not armor. The most important part of an arming doublet isn't holding up the cuisses--they almost stay up by themselves if you have a slotted pin to connect your cuisses to your greaves as most did and if you strap them snugly behind the knee as you should. This design was invented for modern reenactors with inaccurate armor that just hangs on their arms. 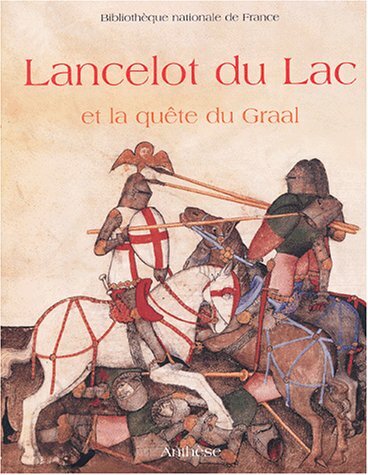 Do you have a full manuscript reference for that Lancelot picture so I can find more information on the manuscript? I'm a little concerned that I may have made a bad choice. I've been sorting out an order with Matuls for one of their BAH2 Gambeson's in order to wear underneath a hauberk. I planned to use this setup for a period of around 1415 and anything up to 1455, combining it with plate arms and legs (held up by a pourpoint). I have no intention of using a breastplate at this time (maybe at some point in the future, but I won't be using a full mail hauberk and will seek a pointed aketon for that use), but may add a brigandine though. Would the Matuls BAH2 be a bad choice for this period, would I be better looking elsewhere ? I don't have the facilities to produce my own fitted aketon/gambeson, so I have to make do with those I can readily purchase. If I were to wear a gambeson or Jack over the top of my mail (am I correct in thinking this was more a 1450's thing, or have I misread ? ), what sort of aketon thickness would I be looking at to go under the mail ? 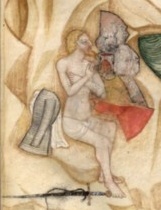 It is Lancelot du Lac et la Quete du Graal, BNF MS. 343. Biblioteche Nationale de France has published a facsimile; I don't have a lot of the bibliographic data (although one of my students has a copy so I could get it), but it's a magnificent book. Try do a search on Barnes and Noble in France. I'll attach a picture of the cover of the book. It appears to be out of print, though a seller in France has/had a copy. I found it on Bookfinder.com. First, the term "aketon" probably isn't appropriate for you. An aketon is a knee-length, long-sleeved, quilted garment worn under full hauberks from the end of the 12th century to the early 14th century. After that, the term arming doublet is probably more appropriate (although others would dispute that terminology--the lexicology of military textiles is like an open fist fight at times). Oh, and a "gambeson" is from that same period: It's a quilted garment worn *over* mail--exactly the opposite of the way the term is used in by modern reenactors (Blair talks pretty definitively about this in European Armor, if you want to read more on it). I looked at the BAH2, but I'm not sure what they copied that from. Honestly? the way they have it displayed (and I'll admit it might be hanging funny so you can't see the shape) it looks like generic reenactment gear... meaning just a square garment with modern sleeves. Also, I think this garment is too heavily padded. Part of the problem you're going to face is that when you talk about you kit what I hear is very confusing. You talk about a garment to be worn under your "hauberk" for the period from 1415 to 1455, but hauberks weren't worn in that period. A hauberk is a knee-length, full-sleeved (usually) garment composed of large links of mail. During the period you're describing they wore either a haubergeon or voiders of mail. A haubergeon is a crotch-length (more or less), *tailored* (meaning fitted) garment made of smaller, lighter links (often with several different-sized links used in different parts of the garment) and is perfectly correct to wear under a jack. But even a haubergeon is too much to wear under the plate of this period; that role was typically filled by mail voiders: these are patches of mail that are pointed to the arming doublet and may include a skirt of fauld of mail along with pieces for the armpits and a mail standard (neck protector). It comes down to what kind of harness you're trying to put together. If you'll tell me the specific harness you're trying to assemble I'll try to help you find the right things to go with it. But when you get into the 15th century the gear gets fairly specific fairly fast, and trying to create mix and match "ensembles" is usually impossible. If you open the main picture (top left) on that page and look very closely at the doublet you'll see a number of small holes all around the shoulder; these are for the attachment of the mail voiders. Note, too, that the garment is *not* padded. While some sources suggest a padded garment (e.g., King Rene's Book of the Tourney talks about padding on the shoulders of the doublet for a specilized kind of tournament employing heavy maces) many imply none at all. The arming doublet isn't about padding anything, it's about providing a firm foundation for the rest of your harness. 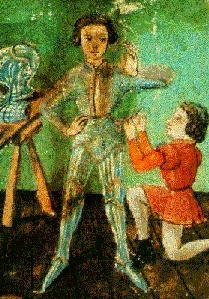 I'll attach a picture of the only source I know that provides a picture of a MS picture of an arming doublet; it's from a 15th-century manuscript entiteld "How a Man Shall be Armed" that talks in detail about exactly how to put on armor; the arming doublet described therein is made of fustian lined with satin and should be full of holes. There's one supposedly extant piece shown in Blair's European Armor, however later sources think that might from the 16th century. I have a picture of it but it's too large to post here.